Even as African Americans gained the right to vote and hold public office, white southerners used legal and illegal — often violent — means to limit their political power. The Ku Klux Klan and other white supremacist groups mounted violent campaigns against African Americans who voted, ran for office, were economically successful or owned land. White allies were also targets. Because groups like the Klan often drew leaders from “respectable” society, notably law enforcement, it was difficult to prosecute and convict offenders in local and state courts. To address this problem, Congress passed the 1870 Enforcement Act. This act made it a federal crime to interfere with voting, and enforced it by taking cases to federal court rather than biased state and local courts. 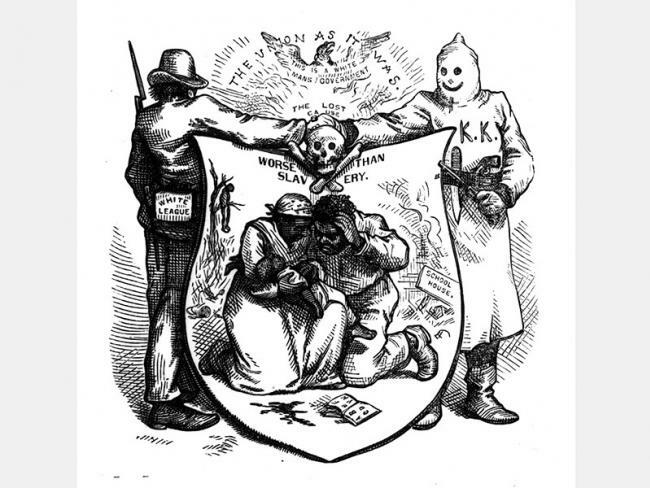 The Ku Klux Klan Act of 1871 gave the federal government the authority to use the army to defend voting rights. With federal enforcement, violence against African Americans fell in 1872, but began to rise again later in the 1870s with the end of Reconstruction. Even with federal intervention, white supremacist violence was never eliminated and is still a problem today. Political change in the North, along with waning enthusiasm for policing the South, meant that the federal response to violence became less forceful in the mid-1870s. When the 1876 presidential election ended with a dispute over electoral votes, the Republicans made a deal with the Southern Democrats, called the Hayes-Tilden Compromise. The Democrat-controlled South agreed to support Republican Rutherford B. Hayes for President. In return, the Republicans promised to withdraw troops from the South, end Reconstruction and stop trying to enforce African American rights, including the right to vote. and limited the power of the 14th and 15th Amendments. In U.S. v Cruikshank, the Court ruled that the federal government could only regulate the actions of states regarding civil rights. States themselves were responsible for regulating actions of individuals. In the 1875 case U.S. v Reese, the Supreme Court held that the 15th Amendment did not guarantee the right to vote, but it prohibited exclusion from voting on racial grounds. These court rulings effectively moved the power to create and administer voting laws back to the states; and they opened the door for states to use tools of voter suppression that disproportionately affected African Americans as well as immigrants and other minority communities. Even though — by law — these rules did not say anything about race, they were crafted to keep certain people from the polls. Tools of suppression included literacy tests, poll taxes, grandfather clauses, property requirements and other measures to restrict access to the voting booth. “Redeemers” were invested in keeping Black voters away from the polls. They wanted to ensure that African Americans would return to being a politically powerless source of labor. Over the next three decades, the right to vote that African Americans exercised during Reconstruction was lost under white rule in the South. The promise of the 13th, 14th and 15th Amendments would only be realized in the South in the 1960s, after passage of the Voting Rights Act of 1965.